The Hydro-Québec Montréal e-Prix weekend is finally here, and though there have been traffic headaches and neighbourhoods that have been transformed for the race fans, racers, and the city are ready for the event that awaits them. The drivers have had the chance to see the track and get familiar with the surroundings of Québec's Metropolis. Our attention turns to the individuals who will thrill the spectators with their skill, the drivers themselves. Maro Engel, of Venturi Formula-e Racing Team, took the time to speak with us about racing on the e-prix circuit. Engel in his debut season in the Formula-e is currently sitting in 17th place with 16 points. Though not at the top of the driver standings Engel has two fastest laps to his name. Engel feel that Montréal has an "exciting circuit, it has ondulations, uphill and downhill parts, and a lot of corners it really looks like one of the best tracks we have seen in Formula-e." The Montréal track offers additional challenges being that it is longer than average, "in the Formula-e the average is about 2 kilometres, [Montréal] is a good third longer." Montréal is a bit of a mixed bag for drivers, Engle said "there is a bit of everything there are slow areas, very wide areas, quite a long main straight which should provide an exciting race." This weekend marks the final two races of the 2016-2017 e-Prix season and Engel offered his thoughts in what spectators can expect. He suggested that it will be a race "where everyone is obviously gunning and aiming for a good strong end to the year." Engel said at Venturi they "have had a really quick car over the last few races, and haven't really been able to materialize [a top finish]." Engel attributed the recent results to "small technical gremlins and bad luck being hit in the back in New York." When asked about the difference and challenges Formula-e and other internal combustion racing Engel had this to say. He said that "driving the cars is pretty challenging they are quite rear-heavy, the batteries are heavier than a combustion engine, and the effects of breaking." He added "it's a whole new type of racing, you have to keep your energy manager open, which opens up strategic opportunities," divers can use a lot at the beginning of a race but will have to conserve at the end. 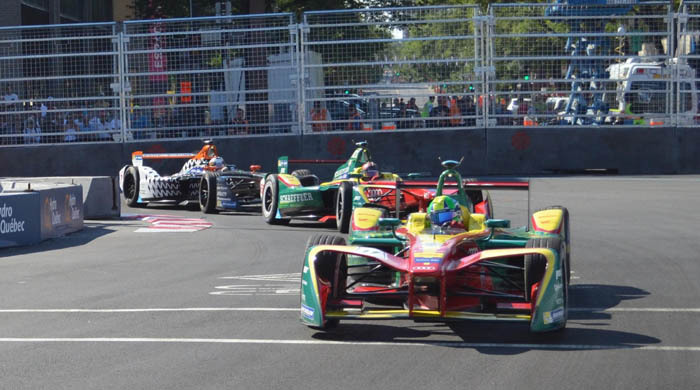 Montréal race fans will be treated to competitive race, with all the strategic manipulation that EV racing can provide. Like every team this weekend Engel and Venturi "are looking to end the season on a high and score a good strong finish." Lucas Di Grassi, a driver for ABT Schaeffler Audi Sport, is quite literally on top of the ePrix world after the two Hydro-Québec Montréal e-Prix races. Di Grassi took Saturday's race, which gave him sole possession of the top spot in the Drivers' Standings. He placed 11th in Sunday's running which was good enough to put a lock on the 2016-2017 FIA Formula-e Drivers Championship. After the first race, Di Grassi took the time to answer a couple of questions. Di Grassi felt that "that his performance [in Montréal] was great, we [extracted] the best out of the car in qualifying." During the race "we had tense moments, [and] a lot of pressure." De Grassi said that his team pulled through for him. "The track is great, absolutely amazing," Di Grassi's comments echoed what was being heard from other drivers over the weekend. He said the track "was technically challenging," and the event was an achievement. Di Grassi said that he hopes "to come here for many more years." Lucas Di Grassi can rest easy today after a hard-fought season, he leaves Montréal as a champion. Montreal is "the best course we have ever had in the Formula-e"
Last week we got an opportunity to talk more on the technical side with Nick Sampson the Senior Vice President of Research and Design for Faraday Future. Over the course of the Hydro-Qu�bec Montr�al e-Prix weekend, we were able to catch up with team drivers Loic Duval and Jerome D'Ambrosio. 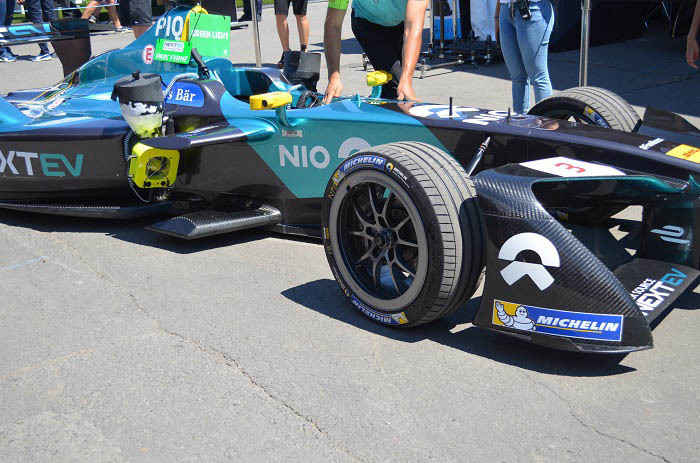 Being that this was the first time the Formula-e made a stop in Montr�al, we asked what their impressions were of the track and installations. D'Ambrosio said this track was his "favourite track of the calendar, it's amazing [with] wide and mid-speed corners and the chicane is very technical." The street track had the bumps and imperfections of a Montr�al street and D'Ambrosio said that "it wasn't too [much], just enough to make it difficult for the drivers." 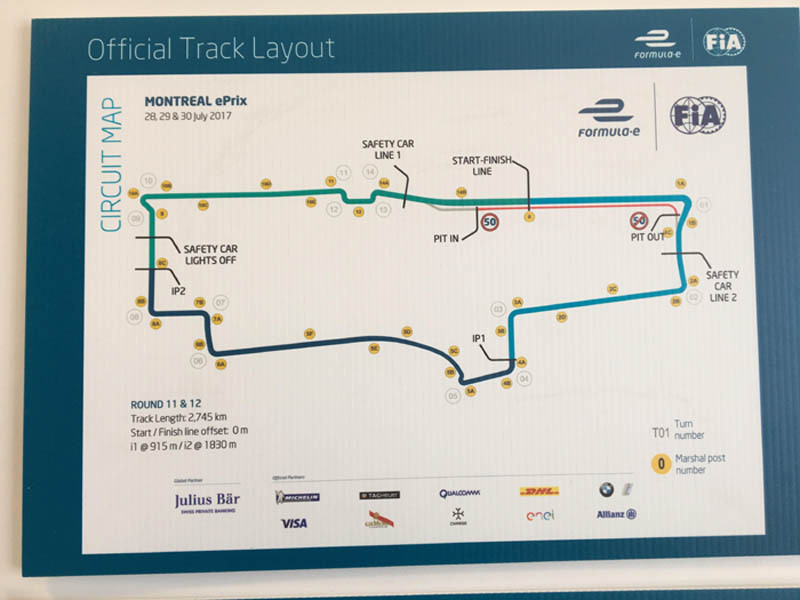 Duval said that the Montr�al circuit is "the best course we have ever had in the Formula-e." He added, "there are a lot of straight lines, a lot of opportunities to overtake." He enjoyed the location of the venue in the heart of the city. On the technical challenges that the Montr�al course presented this is what D'Ambrosio had to say. He said that it doesn't affect strategy too much though concentration is needed on "breaking in turn one [and] turn 11, which is the chicane, you have a few bumps there and it's easy to overshoot yourself like we have seen with a couple of guys in qualifying." When we caught up to the drivers it was right after the first race and Duval said that "it was quite difficult to understand the strategy," from the other racers which were the most challenging part of the day. 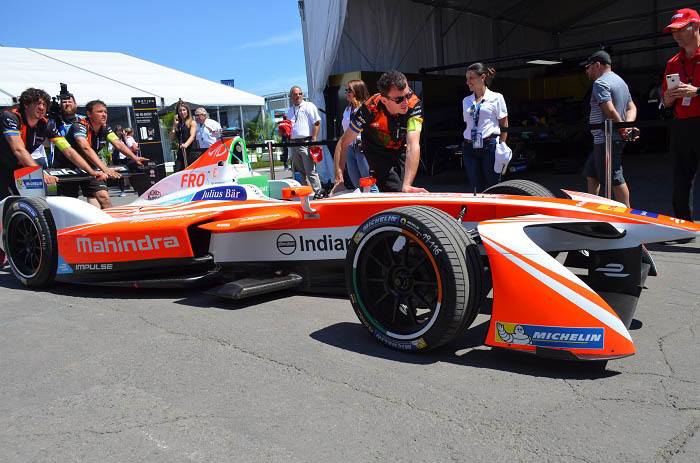 The experience of a Formula-e driver is not identical to that of a driver in Formula-1. D'Ambrosio said for one "in Formula-e you don't have the highest g-forces because you don't have slick tires and not much down force.� He believes with that difference the Formula-e still "offers an amazing race." D'Ambrosio added that the fact that "the car is sliding around it makes it difficult to drive." These drivers have to manage a lot of data from the cockpit, and D'Ambrosio said "this is one of the most difficult cars that I have competed in." Duval said the main difference in e-racing and gas engine is that "with a combustion engine you just run flat out and that's it." In the formula-e speed is important, though "you have an amount of [energy] available for a stint in the race you have to be as efficient as possible." Duval continued "some guys try to push it at the beginning, but you have to conserve later." If you would put a gas racer on the e-Prix track "you wouldn't see as [much] overtaking," Duval said. Strategy comes into play a lot more it seems in e-racing and allows for more passing and excitement for race fans. 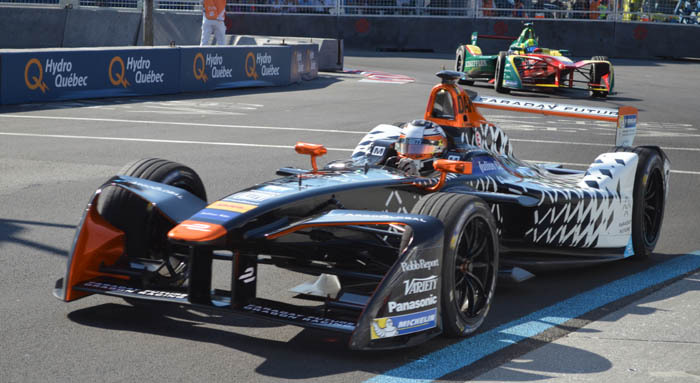 Montr�al has had a taste of the Formula-e, and Faraday Future drivers have had a taste of the city and they like what they have seen. 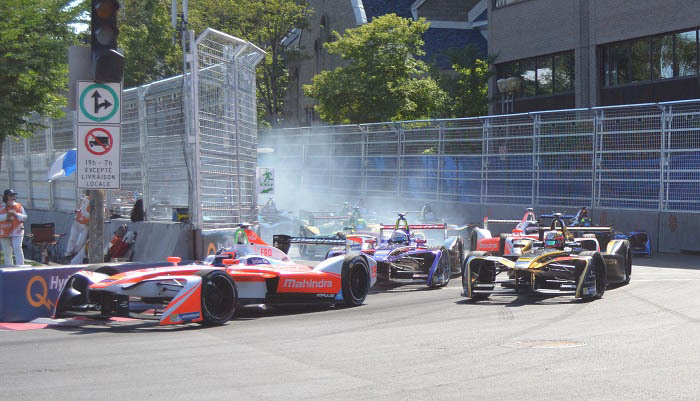 The Hydro-Québec Montréal e-Prix has come and gone, the crowds came and the teams and drivers delivered an exciting weekend as they introduced the Metropolis to e-racing. There were many, many areas that Montréalers could criticize about the planning and execution of this event, and accessibility may be one of them, partially. Those with reduced mobility and those who needed wheelchair access were reasonably well considered in the event planning. A glance at the Montréal Formula-E website and you would see there was a section of seating for those with reduced mobility. There was also a wheelchair accessible platform. The e-Prix installations not only blocked some of the city's major arteries for traffic but also did not allow those who live and work in the area to cross the same streets. The solution was to go over. Overpasses were constructed to allow people to cross over René-Lévesque Boulevard or Papineau for example. Some were located inside the venue and restricted to those who had bought a ticket, others were for the general public. The overpasses were accessible primarily by stairs. We contacted the Ville de Montréal to inquire how those with reduced mobility, requiring wheelchair access, and families with small children in strollers were to access the overpasses. 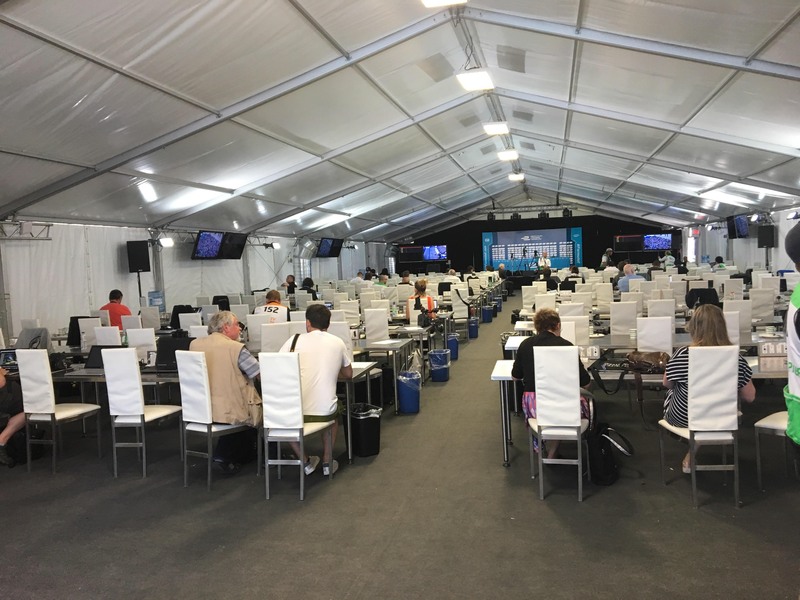 Anik de Repentigny, Communications Officer with the City, informed us that "one of the overpasses for spectators, [and] one for the residents have an elevator." In addressing the accessibility issues, organizers found a novel way to help transport heavy objects over the walkways. The elevators help those with reduced mobility navigate the e-Prix site and their own neighbourhood. The small number of these accessible crossings meant that certain people were restricted to crossing at very specific spots. To leave you with some perspective, the elevator inside the venue was located near the Cartier street entrance and the extreme east of the site, while the section of seating for those with reduced mobility was at the extreme west.